It's the most wonderful time of the year. Let's celebrate! Our festive offerings range from indulging your palate with our chef's exclusive creations at CUT and Morimoto to celebrating New Year's Eve with three different party themes: Black Orchid, Rise and its S.O.A., and the fusion of Walima and Hudson Tavern for the ultimate New Year's Eve package. Keep reading and book your spot with us now! May your Christmas sparkle with moments of love and laughter at CUT Christmas dinner. Taste Christmas in a traditional way, the American way. Relax this Christmas Eve and let the team at CUT by Wolfgang Puck look after you and your loved ones with their homemade, scrumptious 3-course menu. Accompanied by festive music and decorations, you’ll feel right at home! 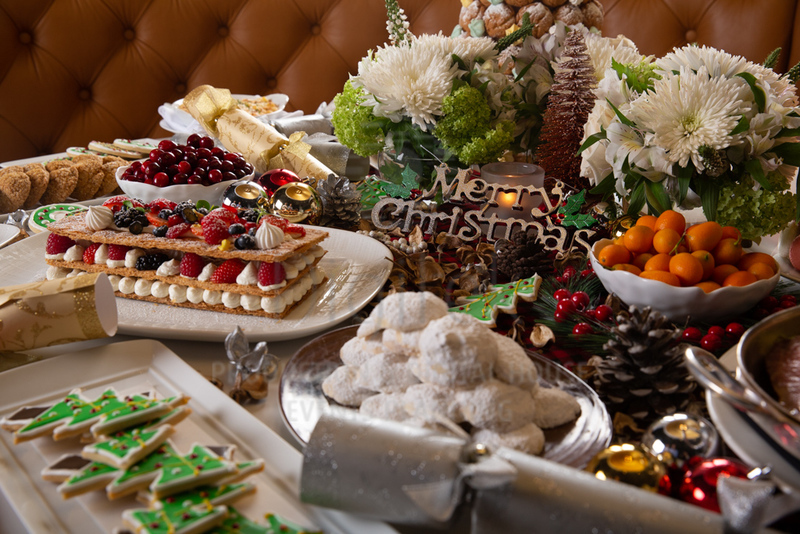 It’s the most wonderful time of the year, and we are celebrating it the CUT Doha way. Wake up and brunch with Santa! He's in town and is making an appearance at our Christmas Day brunch. We heard he's coming full of presents for our guests... so get ready to see if you made the "nice" list. Themed Brunch | Dec. 25 | 315 QAR soft beverages or 415 QAR with enhanced beverages. Celebrate the new year in style at our Hollywood Glam dinner at CUT. Feast on a fabulous five-course meal, accompanied by live jazz, and toast in the new year with a glass of bubbly. Make a stop on our red carpet and let the paparazzi take a picture of your glamorous self. We set the scene, you fill the stage. Welcome to Winter Wonderland! There’s no better place to celebrate 2019 than at CUT’s white-themed party brunch. Enjoy the incredible vibes charged up by the best beats and the most festive brunch in Doha. Themed Brunch | Jan. 1 | 315 QAR with soft drinks or 415 QAR with special drinks. Taking elegance to new heights. Elevate your NYE with Morimoto 7-course gourmet dinner and welcome the new year with some of the most delectable flavors in town. A stylish violinist will set the mood to start the new year with a sumptuous night to remember. Lavish Japanese masks and umbrellas will be given to our guests to sparkle the night until the countdown starts. This NYE the party is in full swing with the American star Soulja Boy! Rap into 2019 with the best R&B hits and live music. Enhancing RISE's Sound of Africa night with our themed party. We have converted RISE into a jungle so you can be wild and free this NYE. Enjoy an open bar and exclusive entry fee from 6pm to 1am. Building a bridge between the East and the West. Representing the best of each with food, drinks and entertainment. Fusing Walima and Hudson Tavern for the ultimate NYE package. Various live stations, laser drummers, a rock band and a spectacular countdown with balloons are waiting for you!